In praise of darkness (and light). This article originally appeared at TomDispatch.com. To stay on top of important articles like these, sign up to receive the latest updates from TomDispatch.com. The following is an excerpt from Rebecca Solnit’s new book The Faraway Nearby, published today by Viking. 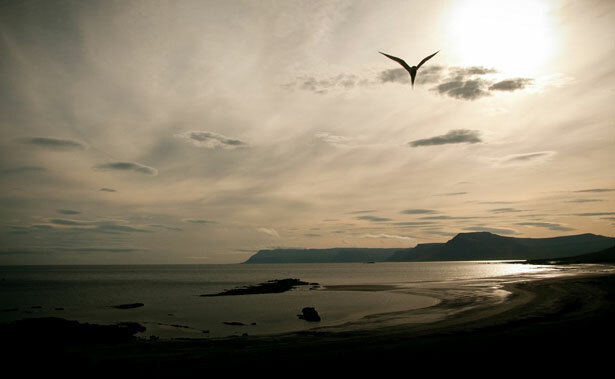 One summer some years ago, on a peninsula jutting off another peninsula off the west coast of Iceland, I lived among strangers and birds. The birds were mostly new species I got to know a little, the golden plovers plaintively dissembling in the grass to lead intruders away from their nests, the oystercatchers who flew overhead uttering unearthly oscillating cries, the coastal fulmars, skuas and guillemots, and most particularly the arctic terns. The impeccable whiteness of their feathers, the sharpness of their scimitar wings, the fierceness of their cries and the steepness of their dives were all enchanting. Terns were once called sea swallows for their deeply forked tails and grace in the air, and in Latin, arctic terns were named sterna paradisaea by a pietist Danish cleric named Erik Pontoppidan, at the end of a turbulent career. It’s not clear why in 1763 he called the black-capped, white-feathered arctic terns sterna paradisaea: birds—or terns—of paradise. He could not have known about their extraordinary migration, back in the day when naturalists—and Pontoppidan himself in his book on Norway—thought swallows buried themselves in the mud in winter and hibernated, rather than imagining they and other birds flew far south to other climes. Of all living things, arctic terns migrate farthest and live in the most light and least darkness. They fly tens of thousands of miles a year as they relocate from farthest north to farthest south. When they are not nesting, they rarely touch ground and live almost constantly in flight, like albatrosses, like their cousins the sooty terns who roam above the equatorial seas for years at a time without touching down. Theirs is a paradise of endless light and endless effort. The lives of angels must be like this. The far north is an unearthly earth, where much of what those of us in temperate zones were told is universal is not true. Everyone walks on water, which is a solid. In winter, you can build palaces out of it, or houses out of snow. Ice is blue. Snow insulates. Water crystallizes into floating mountains that destroy whatever collides with them. Many other things turn hard as rock in the cold. Nothing decays, and so time stops for the dead, if not the living. Cold is stability and warmth can be treacherous. Trees dwindle; shrubs cling to the ground; and further north nothing remains of the plant kingdom but low grasses, diminutive flowers, mosses and lichens hidden beneath the snow part of the year; and nearly every species but the reindeer and some of the summer birds is carnivorous. In winter, light can seem to shine upward from the white ground more than from the dark sky where the sun doesn’t rise or rises for an hour or two a day. And at the poles themselves, there are not 365 days per year but one long night and one long stretch of light, and the sun rises once in the spring and sets once in the fall. Their opposite is the equator, where every day and every night of the year is exactly twelve hours long. The further north or south you go, the longer summer days and winter nights get. In Iceland, each day of spring was several minutes longer than the one before, so that in May the days went from nearly 17 to 20 hours long, and by June there is no true darkness, no night. The sun dipped low around midnight or after and there were spectacular sunsets that melted into sunrises, because the sun never went entirely away. That summer among the terns, I lived at latitude 65, about as far north as Fairbanks, Alaska, and one degree south of the Arctic Circle. If you go farther north, to, say, the town of Longyearbyen in the Norwegian Arctic at latitude 78, which I later visited, the sun rises in late April and stays above the horizon until nearly the end of August, when sunset finally comes—a few minutes before sunrise. There, winter is a night as long as that summer day, running from the end of October until the middle of February. The twenty-four-hour cycle of day and night we think of as normal and daily comes as a rush of rapidly changing days and nights, flickering like a strobe, between the great day and the great night that each lasts 1,000 hours or more. Long ago, I had read about the white nights of St. Petersburg in Russia, at only 59 degrees north, and I had once spent a couple of weeks in the Canadian wilderness at that latitude near midsummer, when night was just a blush of darkness that generally began and ended while I was asleep in my tent. I had always wanted to see the white nights farther north, but actually living through them was a little disorienting. Sometimes during that summer when the sky was often gray but never black, I would think that a task had to be done before darkness and then realize that there would be no more darkness while I was there, and it didn’t matter so much when I rose, when I slept, when I traveled. For me day and night were time itself, and I missed the rhythm and structure they provide. I missed stars. Darkness no longer shut me in: I shut light out to sleep. It was as though I had entered a landscape that itself never slept, never dreamed, that never let up the rational alertness of daytime, the light of interrogation and analysis. The sensuality of night had never been so clear to me, darkness descending like velvet to wrap around you and enclose you in its black cocoon, to take you to your other self and others. In darkness dreams awaken and dreamers merge, which might be how passion becomes love and how making love begets progeny of all natures and forms. Merging is dangerous, at least to the boundaries and definition of the self. Darkness is generative, and generation, biological and artistic both, requires this amorous engagement with the unknown, this entry into the realm where you do not quite know what you are doing and what will happen next. Creation is always in the dark because you can only do the work of making by not quite knowing what you’re doing, by walking into darkness, not staying in the light. Ideas emerge from edges and shadows to arrive in the light, and though that’s where they may be seen by others, that’s not where they’re born. But darkness is a pejorative in English, and the term has often carried emotional, moral and religious overtones as has its opposite: the children of light, snowy angels, fair maidens and white knights. “Darkness cannot drive out darkness; only light can do that. Hate cannot drive out hate; only love can do that,” said the dark-skinned Martin Luther King Jr., but sometimes love is darkness; sometimes the glare is what needs to be extinguished. Turn off the lights and come to bed. When you spend time in the desert, you come to love shadow, shade and darkness, the respite they give to the menacing blaze of day that burns you out and dries you up. Heat is the desert as predator, just as cold is the Arctic’s biggest animal. Desert light is fierce, and at midday it flattens everything into a harsh solid, but early and late in the day, light is golden and every crevice and fold and protrusion of the landscape is thrown into the high relief of light and shadow. At those times day and night intertwine like dancers, like lovers, and shadows are as powerful a presence as the things that cast them, or more so, growing and growing until the sun disappears below the horizon and darkness spreads like water on the land. There was only one dark place left in Iceland that summer, or so it seemed to me, and I went there again and again. Elín Hansdóttir, a young artist who had been instrumental in the chain of coincidences that brought me to Iceland, had made a labyrinth titled Path. In a big room in Iceland’s National Gallery, with the help of two meticulous carpenters, she built a zigzag route of Sheetrock that gave off that material’s dusty clean aroma. One person at a time entered Path, and a pair of watchers in the outer gallery monitored entries and exits and occasionally went in for a rescue, like lifeguards. When you stepped in from the daylight and the door closed behind you, the space seemed to be absolutely dark and then your eyes adjusted to the faint, faint light. You could move forward when you were blind or wait until you could see, but placing a hand on one side of the walls helped you travel too. The path turned at sharp angles, so that you knew that you were being turned around and around, and you lost track of the distance that you were going. The light that leaked through the intentional, careful cracks in the walls and ceiling was faintly lavender blue—it came from fluorescent tubes—and it streamed across the space in strange ways. It was easy to believe that what was dark was solid, what was light was spaciousness into which you could move, but reality as you bumped into it was often the other way around, with open blackness and hard pale surfaces. Your expectations reversed, you moved deeper into the labyrinth, knowing now that you did not know what was solid, what was space you could occupy, but would have to test it, over and over. Path was a space in which you perfected the art of not knowing where you were, of finding out one literal step at a time. Did the path fork? Or was there only one route? How far did it go? Was the way out the same as the way in? All this would have to be found with the hands, eyes and feet as you traveled. At the end, the walls began to press together and it was as dark as it had been at that first moment you stepped in and closed the door behind yourself. And then you could go no farther. It seemed as though it ought to feel claustrophobic, but I found in it an embrace of darkness, a destination, a handmade night. There and back again took me 10 or 15 minutes by the clock, but the time inside had no such quantifiable measure. It was time apart, symbolic time, a slow journey to the heart of the unknown and the unknowable. I kept coming back all summer, seven times in all, once for so long the attendants grew concerned. I felt at home there, more myself than anywhere else in Iceland, somehow. Jules Verne’s novel about Iceland was calledJourney to the Center of the Earth, and this felt like such a journey, or such a center. A labyrinth is an ancient device that compresses a journey into a small space, winds up a path like thread on a spool. It contains beginning, confusion, perseverance, arrival and return. There at last the metaphysical journey of your life and your actual movements are one and the same. You may wander, may learn that in order to get to your destination you must turn away from it, become lost, spin about, and then only after the way has become overwhelming and absorbing, arrive, having gone the great journey without having gone far on the ground. In this it is the opposite of a maze, which has not one convoluted way but many ways and often no center, so that wandering has no cease or at least no definitive conclusion. A maze is a conversation; a labyrinth is an incantation or perhaps a prayer. In a labyrinth you’re lost in that you don’t know the twists and turns, but if you follow them you get there; and then you reverse your course. The end of the journey through the labyrinth is not at the center, as is commonly supposed, but back at the threshold again: the beginning is also the real end. That is the home to which you return from the pilgrimage, the adventure. The unpraised edges and margins matter too, because it’s not ultimately a journey of immersion but emergence. If Path was a book, it was about not knowing, about being lost, and about darkness, the darkness of the deep interior, a book you read with your feet. Anatomists long ago named the windings of the inner ear, whose channels provide both hearing and balance, the labyrinth. The name suggests that if the labyrinth is the passage through which sound enters the mind, then we ourselves bodily enter labyrinths as though we were sounds on the way to being heard by some great unknown presence. To walk this path is to be heard, and to be heard is a great desire of the majority of us, but to be heard by whom, by what? To be a sound traveling toward the mind—is that another way to imagine this path, this journey, the unwinding of this thread? Who hears you? We live inside each other’s thoughts and works. You build yourself out of the materials at hand and those you seek out and choose, you build your beliefs, your alliances, your affections, your home, though some of us have far more latitude than others in all those things. You digest an idea or an ethic as though it was bread, and like bread it becomes part of you. Out of all this comes your contribution to the making of the world, your sentences in the ongoing interchange. The tragedy of the imprisoned, the unemployed, the disenfranchised, and the marginalized is to be silenced in this great ongoing conversation, this symphony that is another way to describe the world. To hear is to let the sound wander all the way through the labyrinth of your ear; to listen is to travel the other way to meet it. It’s not passive but active, this listening. It’s as though you retell each story, translate it into the language particular to you, fit it into your cosmology so you can understand and respond, and thereby it becomes part of you. The word empathy originally meant feeling into, and to empathize is to reach out to meet the data that comes through the labyrinths of the senses. To enter into, we say, as though another person’s life was also a place you could travel to. Kindness, compassion, generosity, are often talked about as though they’re purely emotional virtues, but they are also and maybe first of all imaginative ones. You see someone get hurt—maybe they get insulted or they’re just very tired—and you feel for them. You take the information your senses deliver and interpret it, often in terms of your own experience, until it becomes vivid to you. Or you work harder and study them to imagine the events you don’t witness, the suffering that is not on the surface. It’s easier to imagine the experience of people most like you and nearest you—your best friend, the person who just slipped on the ice. Through imagination and representations—films, printed stories, secondhand accounts—you travel into the lives of people far away. This imaginative entering into is best at the particular, since you can imagine being the starving child but not the region of a million starving people. Sometimes, though, one person’s story becomes the point of entry to larger territories. This identification is almost instinctual in many circumstances. Even some animals do it; babies cry in sympathy with each other, or in distress at the sound of distress. But to cry because someone cries or desire because someone desires is not quite to care about someone else. There are people whose response to the suffering of others is to become upset and demand consolation themselves. Empathy means that you travel out of yourself a little or expand. Recognizing the reality of another’s existence is the imaginative leap that is the birth of empathy, a word invented by a psychologist interested in visual art. The word is only slightly more than a century old, though the words sympathy, kindness, pity, compassion, fellow-feeling, and others covered the same general ground before Edward Titchener coined it in 1909. It was a translation of the German word Einfuhlung, or feeling into, as though the feeling itself reached out. The root word is path, from the Greek word for passion or suffering, from which we also derive pathos and pathology and sympathy. It’s a coincidence that empathy is built from a homonym for the Old English path, as in a trail. Or a dark labyrinth named Path. Empathy is a journey you travel, if you pay attention, if you care, if you desire to do so. Up close you witness suffering directly, though even then you may need words to know that this person has terrible pains in her joints or that one recently lost his home. Suffering far away reaches you through art, through images, recordings and narratives; the information travels toward you and you meet it halfway, if you meet it. Few if any of us will travel like arctic terns in endless light, but in the dark we find ourselves and each other, if we reach out, if we keep going, if we listen, if we go deeper. Reprinted by arrangement with Viking, a member of Penguin Group (USA) Inc. from The Faraway Nearby by Rebecca Solnit. Copyright Rebecca Solnit 2013. NGOs have to sign an anti-prostitution pledge before they can receive AIDS funding from the US government. Read more here.